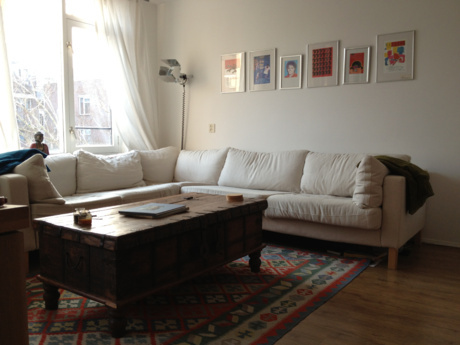 Perfect playful designed family house for 1 or 2 families with (small) kids located in the center of Amsterdam. The house is fully owned and has a lot of space. The canals and the famous Amstel hotel are just around the corner and one of the most famous streets of Amsterdam with lots of nice boutiques, bars and cozy restaurants. The Amsterdam central station is only 10 min away and all the tourist attractions are easily available as the tram and the metro station are within a 3 min walk. We have bikes. You will be spoiled for dinner hot spots in our neighborhood. You will feel at home in a truly unique location. We live in probably the best part of the city: Amsterdam Centre Jewish quarter. Central, yet safe and tranquil. Our house has 4 floors and measures 400 m2. The house dates back to 1873. We bought it 5 years ago and totally renovated it in a modern, stylish and playful way, embracing the historical details. Ground floor: spacious TV room ensuite with a dining room, 2,40 meter dining table, an attached glass house where kids can play with big open doors to the garden. A totally equipped kitchen with a peak through window to the dining room. Every floor has its own toilet designed in the style of the floor. First floor: Master bedroom with a huge double bed, ensuite bathroom (bath & shower), Guest room with a double bed kind size, spacious study with open doors towards a small balcony in front of the house. On this floor is a separate toilet. Attic: this floor is reserved for playing, storage and washing. We have a wash- and dryer machine, which is a necessity when traveling with kids. Garden: Our garden (8 x 10m) is a peaceful place with a terrace picknick table, and a lounge area. It has a large grass open space and a playing house. The garden is conveniently connected to the kitchen and the kids playroom. We have a BBQ, so all evenings can be enjoyed outside. Toilets: 3, one on every floor. 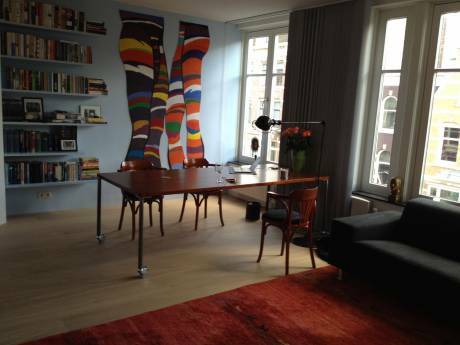 The house is located near the city zoo and close to the famous Amstel. We have bikes for you to use, including a big 'bakfiets', so you can enjoy amsterdam as should by bike. But if you fancy the metro or the tram, the stops are very close by. Amsterdam city is famous for her canals and you can walk for hours just looking at all the shops and the beautiful houses at the waterside. A cleaning lady comes twice a week and we have created a small gym on the top floor which you can use. 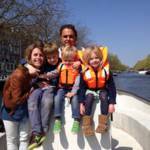 Our au pair lives in the attic apartment, if you would like, she can watch your kids in the evening so you have a real night out in amsterdam without any worry! We are a couple with 3 kids, 9, 7 and 5.
too many to mention. We will have a full city guide for you on the table when you arrive.